Episode 4, ‘Silent Spring’, of the documentary series that is telling the story of the current environmental struggles in China featuring the spoon-billed sandpiper is on the UK’s Channel 4 tonight (Saturday 26 November) at 7pm. The fourth episode in this series of five stunningly beautiful films delves deeper into the unseen consequences of pesticides. In Central China the dangerous impact of insecticides percolating through the soils and waters becomes ever more apparent as mothers seek safer food for their children, with tragic results as we encounter the story of little Wu, a 12 year old girl suffering from bone marrow disease. Novice monk Gama finally makes it across the Plateau to the largest Tibetan monastery in the world, and the Four Musketeers involve schools across Asia in their increasingly ambitious quest to save Spoonie. 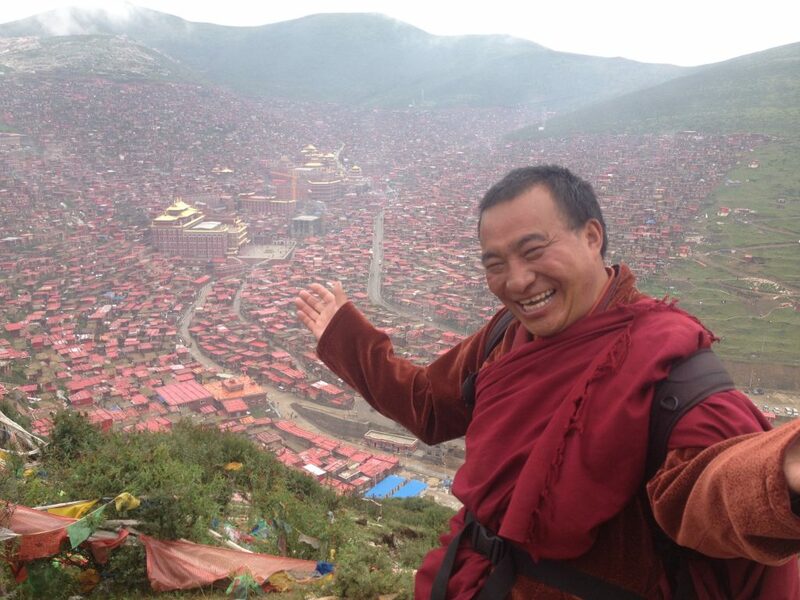 Zhou Jia overlooking Seda Monastery, the largest Tibetan Monastery in the world, home to 20,000 monks and nuns – Western Sichian, China. In episode 4, China is facing a ‘silent spring’ where nature is fast disappearing. The breakdown of the ecological links in the chain of life are beginning to reveal the true cost of economic ambition. A poisoned land where parents are starting to understand the unseen threat to their children’s lives. Where mothers are banding together to seek safer food, ever further from their homes. High above, on the Tibetan Plateau, Living Buddha is taking Little Gama across the Roof of the World to the largest Monastery on Earth, to continue his education. Along the way, they will meet nomadic farmers who guard endangered Cranes and Tibetan Buntings. Their teasing, often funny relationship brings an enchanting humanity to this magnificent place. In central China sparks fly as reporter Xu brings the villagers to meet the Mayor to try to soothe passions and find an answer to the dangerous spike in cancer cases. Accusations of corruption and a contempt for their safety fly. Ms Wu hires a lawyer to take the factory to court. On the coast, the Four Musketeers are contacting children across Asia to to help create their animated cartoon to save Spoonie. Is there no limit to their ingenuity? Schoolchildren across China are being swept up in the enthusiasm for this national nature competition. We are to meet the adorable ‘Snoopy’, a 12 year old girl who has taken a lonely little boy under her wing; his mother has long deserted him. Together they are to make a film about the mystery of the honeybees dying in Granny’s garden – a mystery that leads to find clues to the cause of the catastrophic crisis facing bees worldwide. Living Buddha is to leave little Gama behind to travel down into central China where our theme of pesticides continues. We are to meet the band of mothers who seek uncontaminated food for their children, and the tragic, haunting case of little Miss Wu, a 12 year old dying of Bone Marrow disease – her family facing bankruptcy in their desperate race against time to find a cure. Our interweaving stories continue to reveal ever deeper layers of life in modern China, getting closer to the human heartbeat of this great land.